Whole School: New sign in Upper School lobby reflects UCC’s diverse community; Satisfaction with UCC improves on all fronts; UCC jazz night at "Club Bluenote"
Future Ties: January grades are now in OUAC; The importance of supplemental applications; Applying to Canadian universities outside Ontario? Добро пожаловать Bienvenida xoş gəlmisiniz Benvenuti 欢迎 Bienvenue Welcome! In celebration of International Languages Week, the modern languages department, boarders Philippe Martin and Louis-Charles Généreux, and the office of admission surveyed Upper School boys to find out what languages were spoken by students. The result is an impressive 38 languages, which are represented on a new welcome sign that will soon hang in the Upper School's main lobby. “I knew we had a broad range of languages here, but never quite imagined the extent of the cultural richness,” says modern languages chair Sophia Berezowsky. A full list of languages and translations has been published here. Please contact Berezowsky at sberezowsky@ucc.on.ca if you spot something that should be added or changed. Upper Canada College continues to provide an outstanding learning and working environment, according to results from 2013 online surveys of students, parents and employees. The parent and student ratings were slightly higher on average than those awarded in similar surveys from 2012, showing that the College is moving in the right direction with its strategic plan and efforts to give more individualized attention and support to boys, communicate more clearly and frequently with parents, and offer program enhancements. Using a five-point scale, where five points was the highest possible rating, UCC received a rounded score of four or more in all 13 categories of the student survey and all 12 categories of the parent survey. Boys gave the College its highest ratings of 4.3 for “quality of overall educational experience” and “help is available when I need it,” followed closely by “my Form adviser/House adviser takes an active interest in my welfare” at 4.2. Parents of day students gave their highest rating of 4.1 to “general level of satisfaction with UCC,” “class size” and “communications from UCC to me.” “Quality of teaching,” “there is at least one trusted adult my child can talk to at UCC” and “I am pleased with my son’s interaction with faculty” received scores of 4.0. A survey of faculty and staff members indicates that the College is also a desirable place to work, as they gave a 4.3 rating to “satisfaction with working at UCC.” Scores were just as impressive in the four other categories included in the survey, as the statements “I am proud to work at UCC,” “I feel a sense of belonging at UCC,” “I would recommend UCC as an employer” and “I have a strong sense of collegiality with my peers” all received ratings of between 4.2 and 4.5 and showed small improvements over 2012. The surveys were administered using SurveyMonkey and answered by 625 students in Form 6 and above, 424 parents, and 187 faculty and staff members. UCC jazz night at "Club Bluenote"
Weston Hall at the Prep School will be transformed into "Club Bluenote" on Wednesday, Feb. 5 from 6:30 to 8:30 pm. 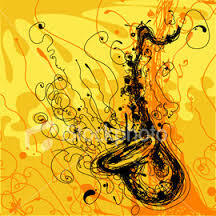 Come and see the finest jazz musicians from UCC in a club-like, comfortable setting. Dessert and coffee will be served during the concert that features the Prep and Upper School choirs, the Prep Jazz Band and all of the Upper School jazz bands. Tickets are complimentary and each performing boy will be allotted two tickets for his family and friends to attend. If families wish more tickets, please email Kathryn Edmondson at the Prep or Tony Gomes at the Upper School if you'd like more tickets. Seating may be tight and we want to remind everyone attending that seating is first come, first served. Upper Canada College typically receives parking consideration from the City of Toronto to allow members of our community to park on surrounding streets while attending large events, but recent amendments to parking by-laws have rendered these considerations invalid between 3 and 7 p.m. 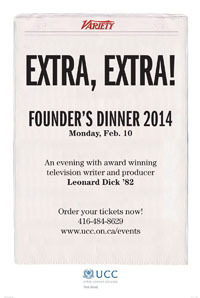 In anticipation of Founder’s Dinner on Monday, Feb. 10, we encourage attendees to take a taxi. Parking on campus is always limited and, as the reception begins at 6 p.m., parking on surrounding streets won't be a viable option without risking a parking ticket. We've arranged to have taxis waiting at the Upper School main entrance, starting at 9:15 p.m., to ensure your safe trip home. If you plan on driving, please be reminded of the on-campus options. You may park on the west side of the avenue, but not on the avenue leading on campus from Forest Hill Road. This is a fire lane and the city has been ticketing. You may park in the arena lot and the lot off of Kilbarry Road. There will be a security officer on duty at that entrance to direct you to available spots. The Hewitt Athletic Centre parking lot will be reserved for handicap and VIP parking. You should have received an email regarding the online re-registration process for the 2014-15 academic year. The email included important instructions and information about the re-registration process, which is available to all eligible families with current College accounts. To access the re-registration form, go to bluenet.ucc.on.ca and log in using your unique username and password. Click on the re-registration icon. Contact HelpDesk@ucc.on.ca if you encounter any difficulties with the online student registration process. The re-registration deadline to submit the online forms is Friday, Feb. 14. Students who haven't been re-registered by this deadline can't be guaranteed a spot for September. Prep and Upper School parents are invited to join the Upper Canada College community to find out about raising money-smart kids on Wednesday, Feb. 26 at 7:30 p.m. in Weston Hall. Robin Taub is a chartered professional accountant (CPA, CA), financial literacy consultant and the author of A Parent’s Guide to Raising Money-Smart Kids. Taub will discuss why it’s so important to teach kids about money and the consequences if we don’t. From allowance to credit cards and many topics in between, she'll share stories and tips to help parents address money-related issues with kids, from the Prep years until they head off to university. The Jeans for Teens clothing drive runs from Monday, Jan. 27 to Friday, Feb. 28. Lightly used clothing will be collected in a bin placed in the Upper School front foyer and donated to New Circles, an organization that provides newly immigrated families with clothes that allow them to assimilate themselves into Canadian society more easily. This student-led initiative collected hundreds of pairs of jeans and other lightly used clothes last year, and it's hoped that UCC can do even better now. If you have any clothes that you've grown out of or don't wear anymore, please donate them to a family that can really use them.